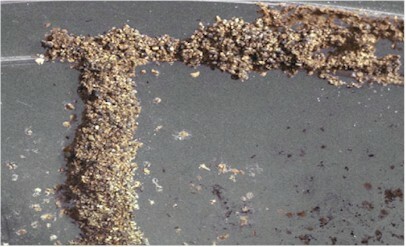 Termites are social insects that live in colonies where labor is divided among a caste system. All members of a colony are related, originating from a single pair. There are three distinct types of individuals: reproductives, soldiers and workers. Reproductives are sexually mature males and females and are responsible for producing offspring and establishing new colonies. Soldiers have larger heads and mandibles (“jaws”) that they use to defend the colony. Workers (Fig. 1) make up the largest portion of the colony and are responsible for enlarging the colony. A mature colony will produce large numbers of winged reproductives each year called “swarmers” and their purpose is to start new colonies. Termites are weak fliers. They flutter close to the ground and are attracted to lights. After the dispersal flight the wings are shed. Termites consume wood and other materials that contain cellulose. Moisture is vital to subterranean termites. They obtain moisture from the soil and must maintain contact with the soil. When termites leave the soil, they construct shelter tubes. These shelter tubes are often the best evidence of a termite infestation. Shelter tubes provide protection from air movement and prevent excess water loss. Their primary function, however, probably is protection from natural enemies. Termite damage usually starts at the mudsill in houses built over a crawl space and at the sole plates of those houses built on concrete slabs. Given enough time, subterranean termites will extend the damage into the wooden floor members, the interior trim and furnishings, and into the walls to the roof timbers. Preventing damage is done by one of two basic approaches. #1 The application of either pre- or post-construction soil termiticides (insecticides that target termites) to treat the soil that termites live in. 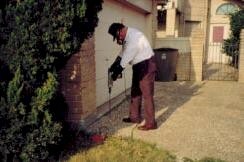 #2 Installing termite monitoring around existing structures. The western subterranean termites are highly destructive to douglas fir and other common building timbers. Western subterranean termites rapidly eat out the internal sections of structural timbers - devouring mainly the spring wood, and preferring to leave the harder summer wood sections. In some countries Termites are made into cooking oil. Termites are fried and sold like food in Zaire. The protein content of termites is higher than in beef. Subterranean termites, the most common kind, live in the soil, from just below the surface to as much as 12 feet down. Up to two million termites inhabit a colony. These colonies consist of a network of tunnels and chambers built around a King and Queen whose sole job is to reproduce. Some of the 55 termite species, queens can lay up to 86,000 eggs a day! Often the queen's swollen body can weigh more than a pencil. The rest of the colony is made up of termites who all play specific roles in keeping the colony healthy. Worker termites keep busy 24 hours a day digesting wood fibers and other forms of cellulose which they eat, digest and share with the other members of the colony. Workers also clean the royal pair, the King and Queen, and carry away the eggs.